A couple of weeks ago I was conducting a one-on-one pistol lesson with a young woman who, though small, seemed physically fit. After firing at least a box of .22 ammo in a Ruger Mark III, I asked if she wanted to try a 9mm. She was hesitant, afraid it would hurt her hands. I had my Beretta PX-4 Storm with me. This is a gun I normally consider easy on the hands. After one magazine, she was done. At first, she was afraid she would drop the gun and wanted me to put my hands on hers to make sure. Me being the size I am and the range partitions being spaced the way they were, that just wasn’t going to work. So, I stood behind her and put my hands on her shoulders for support and told her to fire away. She dipped several of the shots and after I told her she was anticipating the recoil, she relaxed a bit and put some on target like she had been doing with the .22. But, like I said, after emptying one magazine full of 115 grain WWB, she was done, not only with the 9mm, but with shooting altogether. I hope only for that day, but I may never know. 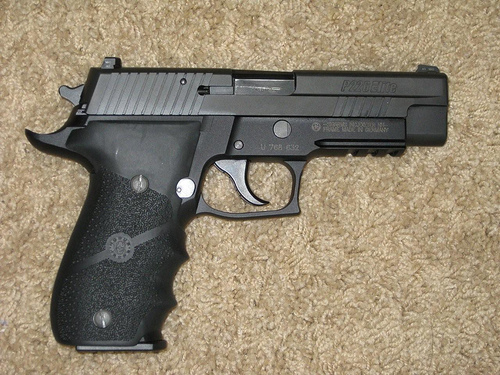 Fast forward a week and I’m at the range with one of my own guns, a SIG P226 Elite in .40 S&W. It was hurting my hand. Strange, I’ve got a couple of 45 autos that don’t hurt my hand when I shoot them. My FNP 40 didn’t hurt my hand when I shot it. What was going on? Being an instructor, I’m always looking for what works, and for me, that day, what worked was relaxing my grip. Yes, I know, a semi-automatic pistol needs a firm grip to function. Actually, what it needs is a solid wrist and arm to slam into as the slide does its work of ejecting the spent round and loading the next one. But, as I found out with a little experimentation, it didn’t require a death grip on the “handle” to stay in my hand. I fired a box of shells and was pleased with the result. Later, I was talking with Jerry Colliver about it, and he compared it to control touch in an airplane. Now, why didn’t I think of that. I’ve flown airplanes and helicopters for years, all the time working to maintain a light control touch so as to not fight the airplane and to produce as smooth a ride as possible. Darned if it doesn’t work for pistol shooting, too. Hold the gun firmly. Make sure your wrist and arm are supplying a solid platform for the gun to cycle against, but you don’t have to squeeze it to death to make sure it stays in your hand. Just like you relax your breathing to minimize muzzle arc, you can relax your grip slightly to minimize tension and felt recoil. Try it and see if it works for you.